Several hypotheses have been described for the evolution of impermeable seed coat, i.e. physical dormancy. It regulates the timing of seed germination in species of several genera belonging to 18 angiosperm families. It also occurs in some mimetic species whose seeds mimic brightly coloured, fleshy fruits or arilled seeds. However, no attempts have been made to understand the importance of dormancy in controlling germination timing in mimetic species. Scanning electron micrographs of (a) dormant and (b) non-dormant seeds showing the hilar side of the seeds. 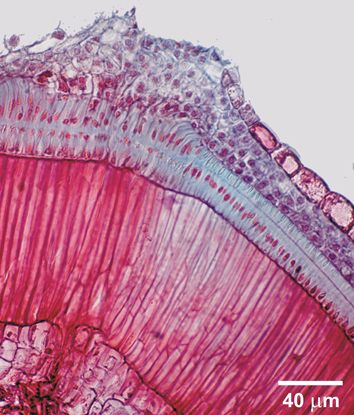 H, hilum; L, lens; M, micropyle. Scale – 700 μm. Image credit: Jaganathan et al. In a recent study published in AoBP, Jaganathan et al. investigated this knowledge gap using Adenanthera pavonina, a small deciduous tree native to southern China and India and commonly used in agroforestry. It’s seed pods are vivid red in colour and impermeable to water. The study explored: (i) the conditions that break seed dormancy; (ii) the location of the primary water gap that forms during dormancy break; and (iii) the effect of seasonal temperature regimes on seed germination. Impermeable seed coats were indeed found to be a form of dormancy and evolved to control germination timing in mimetic species. Specifically, seeds required high summer temperatures followed by moderate autumn temperatures to become permeable to water and germinate in the field during the wet season. The impermeable seed coat of A. pavonina is an adaptation that synchronizes germination with the growing season. Germination rates were however relatively low, 60% after two years in the soil. Future studies should explore the germination ecology of other species with mimetic seeds from different climatic regimes. Next articleIs there a role for plant science in underpinning the objective of global nutritional security?